Spectacle créé à New York le 14.09.2017 au Crossing the Line Festival | FIAF – French Institute Alliance Française. Création de la trilogie #PUNK 100% POP *N!GGA le 11.10.2018 au Crossing the Line Festival à The Kitchen, New York. #PUNK 100%POP *N!GGA est une co-production de The Kitchen, Crossing the Line Festival – French Institute Alliance Française et Quick Center for the Arts at Fairfield University. Plus de soutien a été apporté par la Guggenheim Foundation, l’Institute for Creative Arts at the University of Cape Town, Mid Atlantic Arts Foundation – US Artists International program et American Dance Abroad. 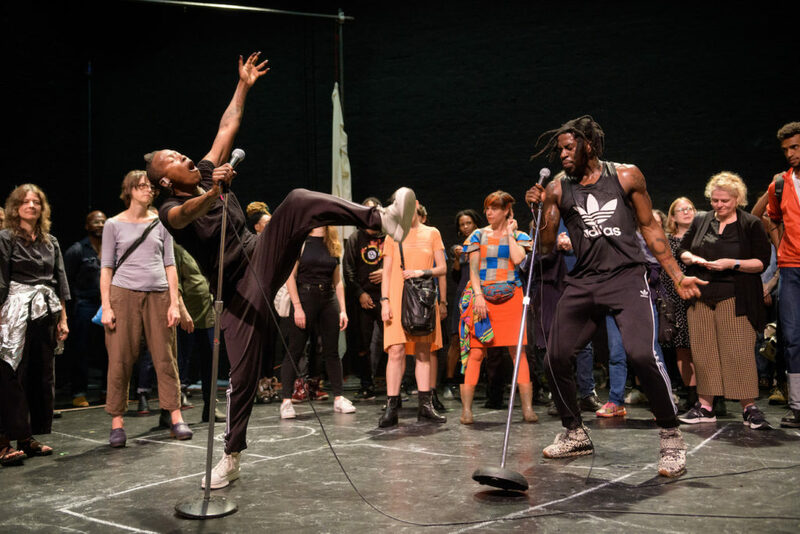 #PUNK 100%POP *N!GGA a été développé grâce à des résidences au Lincoln Center for the Performing Arts – Atrium Series, Gibney’s Dance in Process program with support from The Andrew W. Mellon Foundation in partnership with JACK, Stephen Petronio Residency Center, Bates Dance Festival, University of Richmond Theater and Dance Department, Operaestate Festival – Bassano del Grappa, Brooklyn Academy of Music, Miami Light Project et Sarah Lawrence College. #PUNK is the first part of an album of performances inspired by the years Nora Chipaumire spent training in Zimbabwe and the energy and rebellion of punk and New Wave music of the 1980s. The piece is presented as a fascinating installation of voices, gestures and sounds. A raw concert celebrating the power of the present.